How Serious Are Palpitations of the Heart? Over the centuries and across the globe, palpitations of the heart have been a source of much worry and concern. Classic literature and drama have long described scenes in which performers suffer from palpitations. These individuals may complain of “flip-flops” or “skipped beats.” In some plays, the actor dies at the end of the performance . Indeed, there are people today who complain of these sensations in the throat or chest, and it may lead them to a doctor’s office. Though many of these patients will live for decades without any impairment in their daily activities, some will still show much apprehension about the spells. Hence, they return to health care facilities with a desire that the medical team find a solution . Despite the anxiety that premature ventricular contractions (PVCs) may cause, some of these clients do not have structural heart disease. They commonly receive a diagnosis of idiopathic PVCs, or cause unknown, and the physician may offer nothing more than reassurance. In fact, their prognosis is quite good . The occurrence of rhythm disturbance may be the reason for palpitations, but it is also true that some of these clients have few, if any, ectopic beats. Hence, it is advisable that the doctor perform a clinical evaluation to determine what is really present. This involves history and physical examination, electrocardiogram with rhythm strip, 24-hour Holter recording, echocardiogram, chest radiograph, and blood tests to search for other conditions . The history can be quite helpful because patients may consume things which can lead to irregular rhythms of the heart such as alcohol, tobacco, illicit drugs, vitamins, other dietary supplements, and caffeinated beverages which have become quite popular today particularly on college campuses. Prescription and over-the-counter medications are also a consideration . The patient may also have a recent or current emotional crisis which can contribute to the symptoms . It is understandable that these individuals will want to know whether there is any serious risk to their health or life. There is much concern when the PVCs do not all have the same morphology or when there is sustained ventricular tachycardia. The situation may not be serious even when these are present, but the physician still has to investigate and make a decision about further management . Many of these cases require referral to a cardiologist . Despite these guidelines, there are still instances in which a person comes home and finds a relative--who has died . The evaluation and management of irregular cardiac rhythms can be quite complex and controversial, and the health care team must work together to arrive at the correct diagnosis and treatment plan. James, T., Marilley, R., and Marriott, H. (1975). Clinicopathologic Correlations. De Subitaneis Mortibus. XI. Young Girl with Palpitations. Circulation, 51, 743-748. Akdemir, B., Yarmohammadi, H., Alraies, M., and Adkisson, W. (2016). Premature ventricular contractions: Reassure or refer? Cleveland Clinic Journal of Medicine, 83, 524-530. 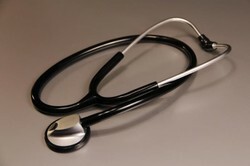 The photo shows a stethoscope and is reprinted with permission from Centers for Disease Control/Debora Cartagena.